Gambling Harm Awareness Week - Time to Pause? Gambling Harm Awareness Week – Time to Pause? Gambling Harm Awareness Week is an annual event designed to raise awareness of gambling harm in New Zealand and provide positive ways for people to help those they are concerned about. This year it will take place from 3 - 9 September. The Health Promotion Agency is working with the Department of Internal Affairs, Lotto New Zealand and minimising gambling harm services across the country to organise a variety of activities. Together, we’ll be encouraging gamblers to take time out to pause their gambling and connect with whānau. Make a commitment that venue staff hand out a wallet leaflet to every gambling patron across the week or regularly place the leaflets on the seats/in the coin tray. Ensure your venue staff are up to-date with their host responsibility training. Encourage staff to improve their skills in one area of host responsibility; for example, identifying the signs of gambling harm or practicing checking-in with gamblers they are concerned about. Put up extra displays of your harm minimisation posters and/or ensure they are located in areas of your bar where patrons are most likely to read them (e.g. the entrance to the gaming room, at the bar, in the bathrooms). Invite your local minimising gambling harm services to come in and meet your staff. The services are there to help, and knowing them can make it easier to refer patrons to them. Consider switching off your gaming machines for an hour (see details below). 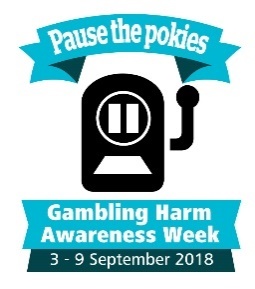 As part of Gambling Harm Awareness Week the Problem Gambling Foundation (PGF), Mapu Maia, Asian Family Services, and several community partners are inviting societies and venues to participate in a nationwide ‘Pause the Pokies’ event. Following the successful ‘pauses’ in the Hutt and Whanganui regions last year, venues are encouraged to switch their machines off for an hour to mark Gambling Harm Awareness Week and get people to think about their gambling. This 40 second YouTube video from Fitzroy Tavern talks about their experience of taking part in 2017. PGF have supporting promotional material available for venues who would like to take part. Please contact Tina McIvor at tmcivor@pgf.nz if you would like more information. You're receiving this because you subscribed via our website.